and St. Hilda of Whitby is still a lifelong interest. Sr. Jocelyn took commercial courses in high school, majoring in accountings, along with developing interests in Brownies, Guides, Cadets and enjoyment in walking. She worked for the Toronto Board of Education while leading Brownies and was a volunteer at the Anglican Congress in Toronto in 1963. She also helped set up the book room at St. Thomas’ Church. Three trips to England and an awareness of wanting “more than a 9-5 job”, I felt called to community, so I approached SSJD but was asked to wait”. Jocelyn then moved to Port Hope to be with the mentally retarded children challenged children from the Aurora and Ottawa houses, working alongside Srs. Anna and Eileen who had been SSJD. In 1969 she entered Community at the age of 26. “I first visited the Convent after Sr. Teresa made me promise on a flight from England that I would visit her, and that was the summer of 1965…. I have spent more than half my Community time at branch houses including the Priory in Edmonton and then Victoria. She took on the Altar Linen department in 1978. 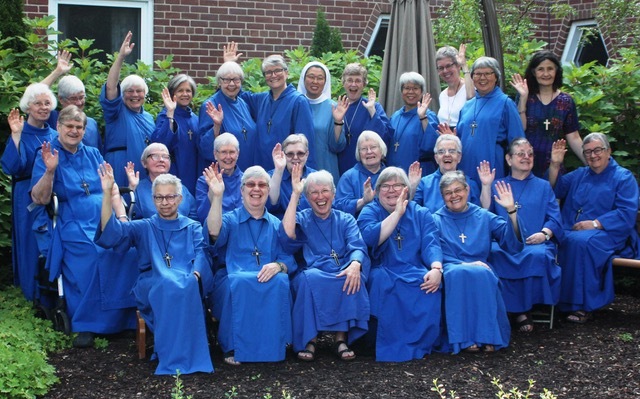 Sr. Jocelyn was involved with the Toronto Diocesan Healing Committee, the Miriam Dobell Centre Committee. She was inducted into the Order of St. Luke in 1978 and was the first lay chaplain in Canada. An early “highlight” for Sr. Jocelyn in Community was “having cancer in 1970 and being given three months to live…..after making my Profession, the cancer signs disappeared”. She is enthusiastic about her stewarding experiences and contacts at the Cathedral where she also “belongs to the Healing Committee, along with attending local clericus, clergy days and doing the House finances…”.